Another addition to the collection of 19th century “freaks”. This one is totally anonymous – no label of who the subject is, or blind stamp on the verso from the photographer. But it’s clearly an original image from the overall quality – not a copy made from someone else’s CDV or stereo view, which makes it a little surprising to see. Oftentimes when photographers were stealing images of another photographer to reprint and sell, they would leave the back of the carte blank so if the copyright holder tried to track them down it would be much harder, and provide them with a degree of plausible deniability “I was merely selling these on consignment – I didn’t illegally copy them! And by the way, I don’t know who it was that sold me the copies…I think he said his name was Smith… yeah, that’s the ticket”. The subject looks familiar to me but I’m not sure – I bet he can be identified though. 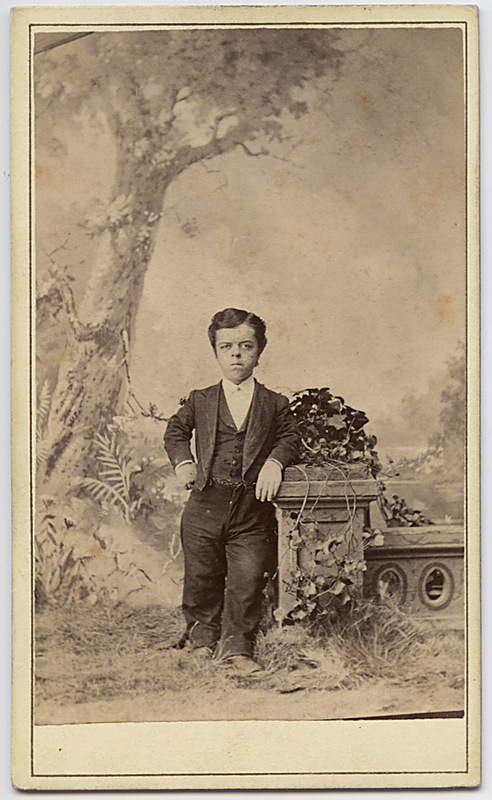 He’s quite handsome, bordering on just unusually short, and very well proportioned, unlike some of the circus freak little people performers of the day.